A while back, I wrote a post on how to calculate dimensional weight. Starting in 2015, the dimensional weight rules changed for FedEx and UPS, so I felt a new post was necessary. Now, here in 2017, FedEx just recently announced that their dimensional weight rules will be changing again. Starting on January 2, 2017, FedEx will change its dimensional weight divisor from 166 to 139 for U.S. Ground and Express shipments. The United Parcel Service (UPS) have also changed their dimensional weight rules for 2017. For any packages that are over one cubic foot in size, or 1,728 cubic inches, UPS will also have a dimensional weight divisor of 139. If the package is less than one cubic foot in size, UPS will use 166 as the divisor. You will find specific examples of how to calculate dimensional weight using the 2017 rules below…. It used to the be the case that, as an ecommerce seller, you only had to worry about dimensional weight when shipping large packages. That is no longer the case. Now FedEx and UPS have new dimensional weight rules that apply to all packages. Now, FedEx and UPS have a dimensional weight divisor of 139. For FedEx, that divisor applies to all packages shipping within the United States. 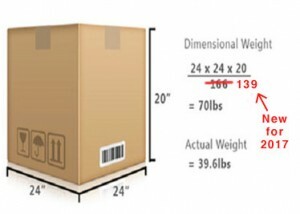 With UPS, the 139 divisor applies to all U.S. packages larger than one cubic foot in dimensional size. For packages smaller than one cubic foot, UPS’s dim weight divisor is 166. For example, let’s say you have a box that measures 12” x 12” x 6”. Multiplying those dimensions together gives you 864 cubic inches. To determine the dimensional weight for FedEx, you simply divide the total cubic dimensions by 139. So, in this case, the dimensional weight is….864 / 139 = 6.2 lbs. What this means is that, when shipping this box, you’ll be billed at a minimum of 7 lbs (the carriers round up to the nearest pound). If the package happens to weigh more than 7 lbs., then you’ll be billed for shipping at the actual weight. If the actual weight is less than 7 lbs….for example, let’s say it’s 4.5 lbs….then the dimensional weight will apply and you’ll be billed at 7 lbs. Why Do Carriers Apply Dimensional Weight? For years, FedEx and UPS did not charge dimensional weight, which meant that packages, regardless of size, were only billed based on the actual weight. Let’s say you sold those foam swim noodles online. If you ship one of those things, it would take up a big chunk of space in the FedEx truck. But, since it weighs next to nothing, your shipping cost would also be next to nothing. So, shipping carriers started charging dimensional weight to help ensure that the costs they incur to deliver a package more closely aligned with the fee they charge to the shipper. Basically, FedEx and UPS wanted to be paid for the space that was occupied on their trucks and planes for big, lightweight packages. When they implemented dimensional weight, it was a big deal. But, at first, it only applied to packages over 3 cubic feet, which meant that it did not apply for the majority of parcels. That has since changed, and their new rule is that dimensional weight will be calculated with each and every package. Over the past few years, the dimensional weight rules have been changing. In 2017, the U.S. dim divisor has gone down with both FedEx and UPS, which will again increase shipping expenses for many online sellers. With the annual changes, many are already asking what will be next in 2018? Will FedEx and UPS continue to make it more cost prohibitive for many ecommerce merchants to ship large packages? At this point, we can’t say; however, regardless of how the dimensional weight rules will change in the coming years, the basic practices to help minimize dimensional weight continue to apply. There are a number of things that sellers can do to help keep their overall order fulfillment costs low in the wake of these changes. FedEx and UPS implemented these new rules for a simple reason….they want to receive what they feel is adequate compensation for the space being utilized in their vehicles. These carriers have found over the years that shippers weren’t too concerned with minimizing the wasted space in their packages. They changed the rules, and it is now in the shipper’s best interest to analyze their shipments and do what needs to be done to reduce any wasted space in their packages. Getting back to the example above, maybe the shipper using the 12” x 12” x 6” box has used that size simply as a matter of convenience. Upon further investigation, he finds that the product can actually fit in a 12” x 12” x 5” box. So, rather than having the dimensional weight increase this year for all shipments in that box, the seller could reduce the height of the box by one inch and maintain the same dimensional weight. You’ve noticed that throughout this post only two carriers have been mentioned….FedEx and UPS. These are the only two carriers that are implementing these new dim rules, and while they’re two of the largest parcel delivery companies in the world, they’re not the only ones. One obvious alternative is the U.S. Postal Service (USPS). USPS wants more ecommerce business, which means they’re in direct competition with FedEx and UPS, and they see these new dim rules as an opportunity to get more of that business. The current dimensional weight rules for USPS are different than FedEx and UPS. 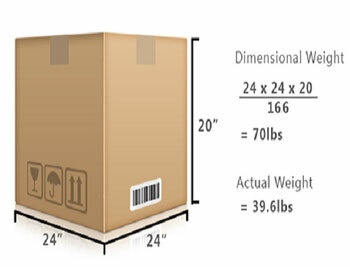 For USPS, if the package is over 1 cubic foot, it is subject to dim weight, but only when shipping to a zone 5 or higher. Additionally, USPS has a dim divisor of 194, not 139, which means the dimensional weight may be significantly lower. Check out our Online Seller’s Guide to Dimensional Weight for a quick overview of how dim rules differ between USPS and FedEx. USPS can continue to expect to get more of the parcel delivery business that UPS and FedEx once had, as they have no plans to change their existing dim rules. If you sell big items that are fairly lightweight, USPS mayb be the way to go. But the Postal Service isn’t the only alternative to consider, as some merchants are looking into regional carriers to handle at least a portion of their shipments. FedEx and UPS do negotiate their dim rules, but generally it requires that a merchant is doing big order volume. The negotiation that these carriers will typically make is increasing the dim divisor to a higher number. If your order volume is substantial, it is worth reaching out to FedEx and UPS to see if you can get a deal. If your order volume isn’t yet substantial, you can also look to outsource order fulfillment to take advantage of ship rates, software and expertise that you may not be able to get on your own. Dimensional weight rules can be a headache, especially for certain types of merchandise. And while the headache is seemingly going to grow stronger next year, merchants should view this as an opportunity to be more strategic and tighten things up with their order fulfillment and shipping operations. And if it’s something you don’t want to have to deal with, give us a shout. We’d love to take the hassles of shipping off your plate. UPS and FedEx recently announced new dimensional weight rules for 2015. Here's how to protect yourself as an online seller. Government needs to investigate because two independent companies with same idea at same time. B/S. Just like the price for parts is overpriced. We’re getting priced out of business. I sell only on ebay, and now the items I sell all require 16x16x16 boxes, and before what cost $18 to send, will now cost $40+ – this will definitely impact my business in a very negative way, as my customers will decide to buy from me or not buy from me now because of the cost to send items…I can no longer use FEDEX or UPS because of this…thanks you guys, you were once my hero, now you’re a zero. If you can’t afford to ship with them use USPS. They are betting you like their services enough to pay extra for it. Collusion? Possibly, but I wouldn’t be a bit surprised if we find out the government was requiring some of this for better efficiency as they have with the appliance manufactures to conserve water and electric usage. Anything they do always cost us money. BUT! With the drop in fuel cost they are saving a lot, just like we are in our trucks, so they should be recalculating their DIM weight formula!! I spoke with a local rep who told me that the ‘dim’ weight will only be for packages that weigh less than three pounds. I wonder if anyone knows the rules. Not true Jim. It is applicable now to ALL packages shipped UPS either by air or ground. I too have many customers complaining to me about how “I” am gouging them for shipping charges. When I tell them their beef is with UPS, the just hang up and look for the item from Amazon with “free shipping”. I think that places like Amazon helped make this to be a bigger problem than consumers did. My family has often joked about the ridiculously oversized boxes they use to send small items using the prime shipping. Maybe boxes will no longer be 10 times bigger than the item being shipped! I wish the shipping companies would have implemented this with the huge shippers before the smaller ones. EXACTLY Lawrence!! I had a 3 hour meeting with UPS yesterday and that is EXACTLY what I brought up. I asked if I could be exempt from dim-weight just like Amazon was !!! If I am not mistaken, this entire article deals only with ground services, and not with express services. Just wanted to point this out, express services have been using DIM weights on all packages for years…and as Lawrence points out, much of the blame can probably be attributed to Amazon which seems to put the smallest items in the biggest boxes…but I’m sure they also get the lowest rates….so it probably won’t impact them much! According to both the UPS and FedEx websites, they are using a factor of 139 rather than 166 to determine the dimensional weight. What that means is that dimensional weight for both kicks in at Freight Class 85 which is 12 lbs per cubic foot. To be fair, it seems that they should use anything greater than Class 100 as incurring an extra dimensional weight charge. Class 100 is a density of 8 lbs per cubic foot. UPS domestic is 166, air and international is 139. 139 is international express factor. 139 is an international express factor. If you only needed $5 of gas, would you pay $50 because that’s the maximum amount your gas tank holds? Of course not. This is nothing short of a rip off scam. Already several lawsuits against UPS and more are coming!!! Its just plain simple cartel. Despite prices of oil are going down, They are increasing shipping costs. Its just killing the business of small companies. Amazon will love this. Chinese websites offering free shipping will be here for a longer time. I just entered a new contract with FedEx stating a dimensional weight of 220, air and ground. The last contract, it stated 194 dim weight. Period. Now this cu ft thing is throwing me into confusion. Hi Sue, thank you for your comment. And that’s a good question. It may be that FedEx is adding a cubic foot qualifier to the dimensional weight divisor of 220. For example, perhaps FedEx will use the divisor of 220 only if the package is less than a certain number of cubic feet. In 2015 (and now in 2016), FedEx and UPS calculated dimensional weight on all packages, substantially impacting the order fulfillment costs for ecommerce sellers. Prior to that, however, dimensional weight was only applied if the package measured three cubic feet, or greater. I’m happy to chat further if you’d like. Please feel free to email me at sales@efulfillmentservice.com. DIM Divisors DO NOT APPLY to packages below 1 cu foot (12″x12″x12″). That is what we negotiated. So something that was important to us, wasn’t conveyed to the carrier, thus helping us. A box 49″x9″x4″ is less than 1 cu foot, so the new surcharge of anything over 49″ DOES NOT APPLY. The drawback, is we must not input the dimensions or we will pay DIM costs. We use laser DIM devices. We use a few regionals, nationals/internationals, and international only. 3. NO DIM on 1CU or less, DIM 245 above that. 4. Carrier 4 has DIM 245 also, but charges DIM’s on everything. 5. Carrier 5 we are unsure, but so far been ok.
6. Carrier 6 DIM 194 past Zone 5. Consumer choice should hold precedence if seller is not going to offer “free” shipping”. I live in Alaska and have to say that we cannot get product here without argument. I generally pay three times the cost of shipping and still it takes up to three weeks to obtain what I need. federal express is the only company that will provide two day delivery and Saturday if desired. Customer will pay additional for service, however they are more reliable, and do not show up on your door step after 8:00 at night. I have used their service for more than 40 years and will continue when I have an option. UPS is not my favorite but I am more often forced to use them against my will. USPS is totally unreliable anymore due to unionized activities to say the least. Hopefully citizens in the USA will learn that politics plays a vital roll in their every day lives, and choose more wisely when electing future political representatives, hopefully those who put the people before the dollar. Thank you for your comment. You certainly raise some valid points, especially with regard to living in Alaska and the associated order fulfillment costs and challenges relative to ecommerce purchases. I also appreciate your insight when it comes to shipping options and carriers for Alaskan deliveries. We too find that FedEx is a very reliable carrier, and offers a bit more flexibility to accommodate the delivery needs of consumers. Unfortunately, regardless of whether or not dimensional weight applies, there is still a surcharge that applies when shipping to Alaska. Over time, however, I would expect that surcharge to begin to diminish as both carrier networks and ecommerce order fulfillment needs continue to expand. UPS and Fedex a run for their money! You already have the distribution centers. I am on board! I read an article called Dimensional Weight for Ground Shipping. I was wondering if UPS and FedEx are using the DIM weight for shipping packages, how many packages can fit on the truck? I guess I am just trying to understand the concept of Dimensional Weight. Thanks for reaching out here on dimensional weight for FedEx and UPS. These two shipping carriers have trucks that vary in size, but the concept, as you alluded to, is that the truck, regardless of size, is only so big and, therefore, FedEx and UPS and others need to ensure they’re generating a certain amount of revenue per truckload. If dimensional weight did not exist, then shippers would only be charged based on actual weight and they could fill giant boxes with lightweight goods, meaning the carriers would not generate the revenue and profit they’re looking for. As dimensional weight rules have become more strict over the past few years, it has forced ecommerce merchants and other shippers to reevaluate their box sizes (and even their products, in some cases) to minimize their shipping costs. Thank you. I have one more question. What’s the difference between domestic and international dim divisors? I noticed that FedEx went from 166 to 139, why is that? That’s a great question. Currently, the FedEx dimensional weight divisor is 139 for both domestic and international shipments. They lowered their domestic dimensional weight divisor from 166 to 139 a couple of years ago, as they concluded that shippers were still not being considerate enough with the packaging sizes they were using, and those carriers wanted to further increase their density/revenue per truckload. Thank you so much for helping me understand this information. Does a lower dim divisor mean a higher DIM weight and does a higher dim divisor mean a lower DIM weight? Thanks for reaching out. That’s a great question. Yes, a lower DIM divisor means a higher DIM weight with FedEx and UPS. For example, it used to be that FedEx and UPS had a DIM divisor of 166. For a package that measures 12″ x 12″ x 6″, the total cubic volume is 864 cubic inches. With the old dimensional weight divisor of 166, the DIM weight was (864/166) = 5.2 pounds, which would be rounded up to 6 pounds for shipping. With the new dimensional weight divisor of 139, this package now has a DIM weight of (864/139) = 6.2 pounds, which will ship at 7 pounds. Thank you for the example. It helps me understand the changes. Just a fedex driver that stumbled upon this post… not sure if people actually understand how full we pack our trucks. Often times we cant get everything in so it’s really frustrating when the customer opens a big box and pulls out a tiny package. Makes for a good laugh but I could really use that space. We ship a very light weight product that fills up large boxes. Our product is not worth much. our shipping rates have gone up almost 300% because of the new dimensional weight rules. Amazon ships for pennys on the dollar for what we do. US Small business commerce is getting totally screwed. I will try to negotiate but a 10% discount does not help! For your costs to have gone up that much, it sounds like what’s happened is that you were getting a huge bargain, costing the shipper space that you weren’t effectively getting charged for, and they’ve rectified that. Since FedEx turned just over 1 billion in profit last year…I dont think they were losing out on anything. Hard to feel very sorry for them.